You will probably remember both my previous article about the "rancidity" problem with over-the-counter fish oil products (see "3/3 TOP-Selling US Fish Oils Exceed Maximal Peroxide and Total Oxidation Levels - Levels Roughly 4000% Higher Than in Medical Grade N3 Supplements, Harvard Study Shows" | read more), as well as my often-phrased general skepticism about the usefulness of high dose (>1-2g/d) fish oil supplements. Krill vs. Fish Oil - Is one Better? Back in the day, I already mentioned that the evidence on whether and how detrimental the consumption of (partly) oxidized fish oil actually is 'skinny' to say the least. As researchers from the University of Maine point out, the same goes for the "complete repertoire of physiological and metabolic effects of differing fatty acid composition in the diet" (Miller 2019). And while we do know that we eat less N3s than our forefathers, we have (a) no clue how much we actually 'need' and (b) how significant it is that the N3-fats in our diets are 'fresh' and not already (partly) peroxidized. ...is eventually only a side-finding of a study that would otherwise probably have ended up in the SuppVersity Facebook news (and only there) instead of inspiring this closer re-analysis of where we are in the realms of "oxidized fish oil"-science. Yes, it's a rodent study but ethics, money, and practicability all favor doing rodent vs. human studies in the early phase of the scientific process and early is exactly where we are when it comes to the (patho-)physiological effects of oxidized EPA and DHA. With that being said, one should keep in mind that the results must not necessarily translate 1:1 to human beings and that - given we're talking about mice - the sample size of the four intervention groups, i.e. N=6-8 ten-week-old C57BL/6J male mice, wasn't exactly what you'd chosen if the N3 oxidation had been your primary research interest. temperature. Body weight was measured weekly. Food intake was measured daily for 7 days, then weekly until 28 days. 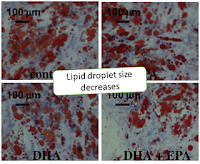 The DHA+EPA induced reduction in inflammation comes with a decrease in lipid droplet size (O-Red staining from Ferguson 2019), which has been linked to the (ill) metabolic health effects of body fat... it should be said, though, that this will lower the leptin production, a reduction scientists linked to "metabolic damage". But there's good news (in form of the latest studies), as well... for those of you who manage to buy non-rancid products and store them properly, scientists from the Vanderbilt University Medical Center have potentially relevant results - especially if you've got a few lbs of bodyfat too much (Ferguson 2019). In their study, the US researchers used primary human adipocytes from (lean and) obese subjects [the important tests were done on the "obese" fat cells]. When the cells had been incubated with EPA and DHA for 72h, the authors observed that EPA and/or DHA attenuated both, the acute inflammatory response to lipopolysaccharide (LPS) and the subsequent immune reaction. At the same time, the unoxidized oils reduced the lipid droplet formation and lipogenic gene expression (=fat storage ability/efficacy) without alteration in expression of adipogenic genes or adiponectin secretion. As previously suggested, the main research outcomes of Miller's study were hardly surprising: Both, the high-SFA and high N6 PUFA diets were indistinguishable in terms of cell size, crown-like structures, and browning patterns of the fat cells. 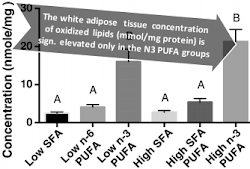 The high N3 PUFA mice, on the other hand, displayed the same increased browning (or, development of inducible and multilocular beige/brite adipocytes), and smaller cell sizes. Sounds great, right? Well, yes... and no. The fat cells of the high N3 mice also displayed a "marked inclusions of lipofuscin stain, a plastic-like aggregate in the liposomes that is a sign of tissue malfunction" (Miller 2019). [Put simply: lipofuscin is fuelling the aging process - at least partly by messing with the major cellular degradation mechanisms, i.e. proteasome + autophagy | Papevgeniou 2018]. In the study at hand, this accumulation was observed both in the regular subcutaneous (scWAT) fat, as well as the organ fat around the kidneys (perirenal white adipose tissues | prWAT) - more importantly, however, it was observed exclusively in the mice who had been fed the N3 PUFA diet (confirmed through bright field microscopy and autofluorescent + fluorescent microscopy - an unwholesome glow that was not observed in the animals on the "bad" saturated fat diet | see Figure 1). 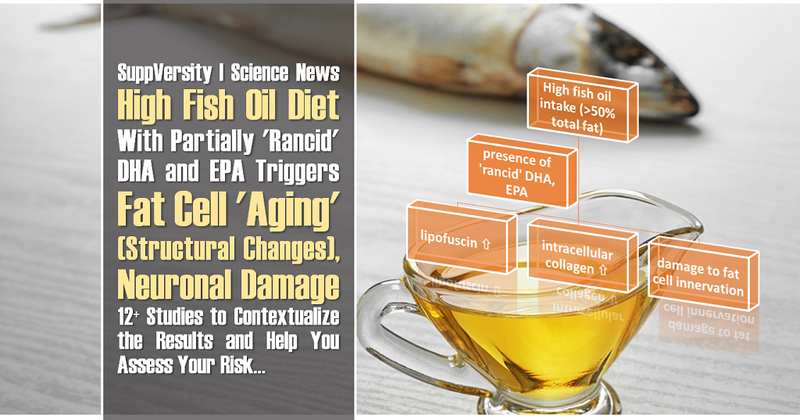 The real news is not tissue damage, though, the real news is that this damage may be due to 'rancid' fish oil - an issue that is largely (and falsely) ignored in N3-research. Before you throw away your rancid retail fish oils, your "omega-3 eggs" and your "canned salmon", let's revisit all the results of the study. The bad news is, as previously pointed out, that there's evidence for cellular damage in response to the high N3 diets. And this evidence is not restricted to the presence of lipofuscin as both marker and driver of cellular aging. The high(er) N3 intake also produced significant increases in fat cell collagen deposition, indicating more tissue fibrosis, "an accepted indicator of dysregulated adipose tissue", as well as "more crown-like structures around the adipocytes of n-3 PUFA mice, indicating greater immune cell infiltration in the stromovascular fraction for this diet" (Miller 2019). According to Miller et al. the last observation, i.e. the presence of large crown-like structures is particularly surprising as those are usually found only when fat cells are close to bursting from the seams... and yes, you remember that correctly, the N3 diet actually led to lower total body fat and fat cell size. Do "functional" omega-3-enriched health foods have to be avoided? When it comes to the study at hand, we're actually looking at an experiment that used a diet that represents the average "N3-fortified"-bullsh*t food industry product you've just paid a premium for at the grocery store. How's that? Well, even though Miller et al. and their suppliers undertook "numerous attempts [proper handling and particular care of the fish oil and diet manufacturer] to mitigate it, the N3 PUFA diets readily under[went] peroxidation" (Miller 2019). Needless to say that the same will go for your average N3-enriched "food" product... with the advent of increasingly more sophisticated ways of encapsulation of the added fats, could solve this problem in the future (Dellarosa 2015), though. One thing that should make you rethink pounding dozens of cheap fish oil pills (also because it may actually impair your thinking) is the fact that the scientists also observed signs of a "negative impact on myelination and nerve health" in response to the N3 diet - a bad effect on the central nervous system which was only "substantiated by [the] decrease in tissue levels of brain-derived neurotrophic factor (BDNF), as well as decreased expression of synaptic markers (synapsin I & II, synaptophysin, psd95" (Miller 2019), Miller et al. observed alongside blunted thermogenesis (UCP down) they interpret as further evidence of an effective impairment of the communication between brain and body fat cells. The good news from the study at hand must not be ignored, though! Especially in view of the fact that the animals on the high N3 diet exhibited the same beneficial metabolic effects for which DHA, EPA, and ALA have become the darlings of the "health food"-industry: decreased body, adipose weight, and fat cell sizes, as well as better glucose tolerance, compared to animals who were fed a high SFA diet. Unfortunately, the study at hand was not designed to elucidate the interactive effects of preformed oxidized N3s in the chow, and how it relates to the local oxidation of omega-3 fats in the cells of the scientists' hairy subjects. What Miller et al. (2019) were still able to do, when they detected the unexpected detrimental effects of the high N3 diets on the rodents' adipose tissue health, was to confirm by "two independent approaches [...] that the n-3 PUFA diets themselves, as well as the tissues from mice fed this diet, exhibited signs of peroxidized lipid species." The obvious question now is: How bad is your habitual N3 intake and does it put you at risk of having your CNS 'go rancid' and your fat cells dysfunctional? Duration - The detrimental effects were observed in mice, not men or women, the 28-d period is thus representative of years of N3 consumption in human beings and the occasional 'rancid' fish oil cap, is not going to either impair your brain <> adipose tissue communication nor the structure and function of the fat cells, themselves. 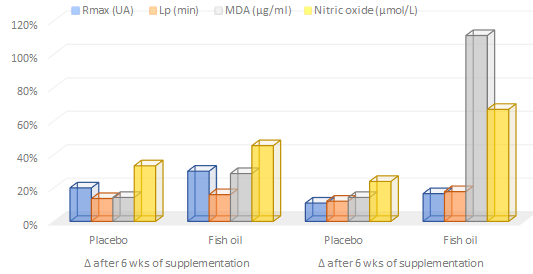 Dosage - Moreover, the relative N3 content of the high N3 diets was >60% with the lion's share of the omega-3s being consumed in form of EPA and DHA (>50%) - to end up there (i.e. 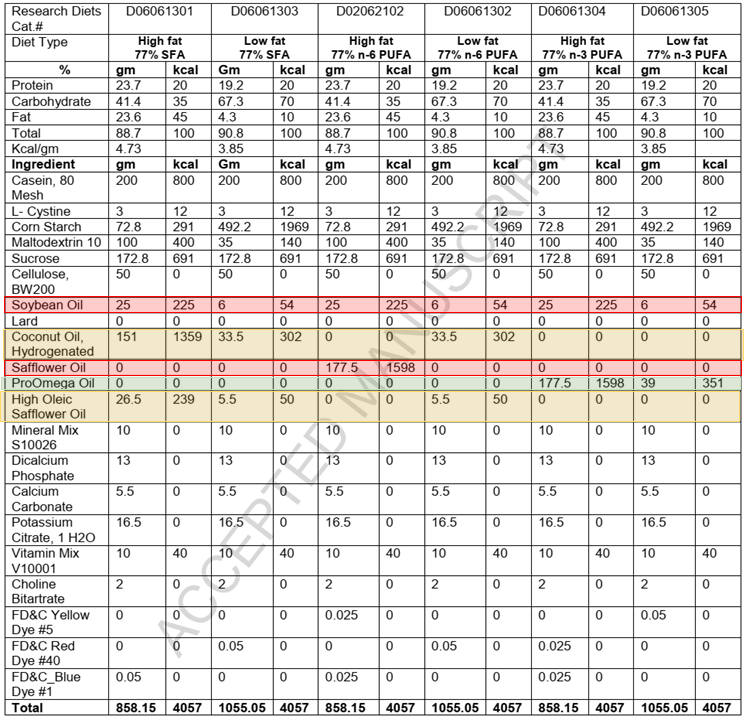 >50% of all your fats from DHA + EPA) you have to either pound truckloads of wild-caught (low omega-6) fatty fish and/or follow the Internet-guru-bullsh*t-advice to consume "at least 5g of EPA+DHA" per day in form of (probably rancid) fish oil caps. The only study I know of that used a "real-world" scenario (including daily use of the product) shows that bottled fish oil goes rancid within ~30 days (Pak 2005). In that, the daily opening of the bottle is part of the problem - hence, using fish oil caps and putting them into the fridge is the better choice. Where to get your N3s from? While fish oil supplements, canned sardines, and salmon have previously been shown to contain similar(-ly high) levels of oxidized lipids as the rodent chow in the study at hand (see Figure 3), tuna in water (or oil), as well as kippered herring tended to have lower MDA levels - at least the products that were tested in the study at hand. With capsules, you are probably on the safer side but still, eventually, you can never know for sure what you'll be getting and as Albert et al. (2013) point out, the inferior quality of your average fish oil supplement could also explain the high heterogeneity that characterizes "fish oil research", in general. Exposure - What we cannot do, though, is simply say that we're not exposed to rancid fish oils and/or the formation of N3 peroxides in our bodies. After all, Miller's analyses of the rodent chow yielded MDA levels in the same range as you'd see them "in common fish oil supplements and food items that are high in N3 (tinned sardines and salmon)" (Miller 2019). N3-oxidation-specificity - It's always easy to point with a finger to confounding factors. However, the "bad" omega-6s, despite producing more metabolic damage (body fat gain, reduction in glucose sensitivity,...), actually protected the mice "from the changes in gene expression that were observed in scWAT of n-3 PUFA mice" and the mice on the >60% N6 diets did not display a reduction in peripheral nerve markers, either - an observation the authors of the original paper rationalize by stating: "This is likely because the N6 PUFA diet was not peroxidized" (Miller 2019). Mechanism - While the mechanism isn't fully understood yet, there's one thing the benefits and detriments could have in common: they could be first or second order effects of the cellular defects due to the incorporation of already oxidized DHA, EPA, and ALA or their endogenous (~in your body) oxidation. This would, after all, explain both the impaired CNS communication and the reduced ability to store body fat in the absence of changes in energy intake and a slight but measurable decrease in energy expenditure. So where does all this lead to? Easy: All roads lead to whole unprocessed foods... how's that? Well, if you've ever bought fresh fish and left it unrefrigerated for a couple of hours you will have smelled your mistake right away. Unlike fish oil, a real fish contains more than just molecularly distilled fats. 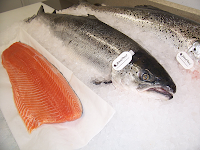 Those other ingredients - first and foremost proteins - produce the nasty, 'fish odor' that's telling your olfactory system that the tuna, salmon or trout is ripe for the dumpster, not your pie-hole. The lack of standardization and testing is a potentially severe problem that makes it difficult for customers to get "healthy fats" that actually deserve the attribute "healthy" and don't come with a peroxide load that puts your fat cells at risk of lipotoxicity and neuropathy. How's that? Well, just as Miller et al. write in their latest paper: "[T]he high level of peroxidation in the supplements we measured indicate that the health benefits may be outweighed by the risks" (Miller 2019). Don't be a fool, though, this is not a "bad FDA, US-only"-problem. As the authors highlight in the discussion of their results, there is another study that looked at the 'rancidity' of commercially available fish oils on New Zealand's supplement market found that fish oil supplements not only had less of the beneficial EPA and DHA than reported (less than 67% on average) but were also peroxidized at a rate of 83%, with some at toxic levels (Albert 2015). Unfortunately, that's a result that's pretty much in line with the data from a Norwegian study that determined that most fish oil supplements tested were above the recommended limit (Halvorsen 2011). Is oxidized fish oil worse than just ineffective? Convincing evidence that the answer to the question is "yes" comes from Spain, where Garcia-Hernandez et al. (2013) compared the effects of N=16 tested commercial fish oil supplements in 52 healthy women who consumed 300 mg EPA + DHA of regular fish oil with either low or high peroxide levels. The results are what you'd expect intuitively: The "fresh" fish oil produced significant and unique reductions of cholesterol, as well as somewhat surprising improvements in blood pressure in the subjects who were randomized to the "low" peroxide oils (low is relative, here: 20-30 meq/kg). The ladies in the high peroxide (50-95 meq/kg) group, on the other hand, saw neither a reduction in cholesterol nor improved blood pressure levels. These results have the authors conclude "that the level of oxidation of o-3 supplements has to be considered as a key factor that may affect the circulating lipidic profile of consumers, producing an opposite effect than as claimed by the product" (Garcia-Hernandez 2013). 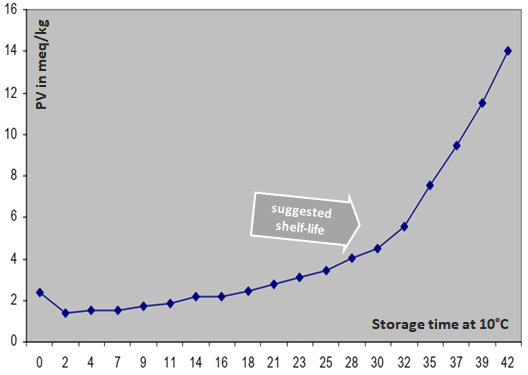 According to the little data there is on this topic, the shelf-life of bottled fish oil is <36 days (starting when the bottle is opened) when it's stored at 10°C and used according to the recommendations (Pak 2005) -- the (more or less randomly set) safety limit of 8 meq/kg is surpassed after 45 days at 10°C and 60 days when it's stored in the fridge at 4°C (Boran 2006). In that, the last-mentioned, higher value was determined in a less realistic scenario (no daily opening and use of the bottled oil) compared to the previously cited study by Pak. In every case, however, rosemary extract as an antioxidant supplement to your supplement may extend the time you can store and use your fish oil significantly (Wang 2018). 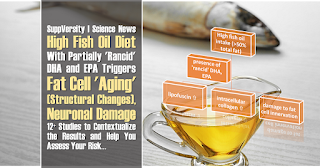 Even though 'sourcing' a non-oxidized fish oil and storing it properly is probably the average consumers' #1 problem, those who insist on consuming copious amounts of fish oil are facing another challenge: protecting EPA, DHA from oxidation once it is in their bodies! higher levels of lipid oxidation (MDA) at rest and during the recovery period, when the MDA levels were elevated in the fish oil group while they didn't change in the placebo group. Furthermore, the transient increase in lipid oxidation in the post-workout period doesn't necessarily have to be a bad thing. After all, we all know about the contribution of hormetic effects (=adaptation to non-lethal stress) that are ultimately driving most, if not all exercise-induced adaptations. Unfortunately, the corresponding research which has recently been reviewed by Rossato et al. (2019) is about as inconclusive as the rest of the fish oil literature. the only thing we seem to know for sure is that we still have a lot to learn before we can tell if and at which doses fish oils are beneficial for athletes (vs. the normal population). Plus: It's almost certain that training status, baseline diet, type, volume and intensity of exercise, and, obviously, the type and quality of the omega-3 supplements interactively influence the efficacy and probably even the general direction (ergogenic vs. ergolytic = performance-enhancing vs. -reducing)... When I end this article on the common note that "more research is necessary", it's not without the demand that all these new studies must follow Albert's demand from 2013 "that all clinical trials investigating omega-3 harms or benefits report the results of these assays; this will enable better understanding of the benefits and harms of omega-3 and the clinical importance of oxidized supplements" (Albert 2013). In the meantime, I'll leave you with the general advice from the bottom line. So, do you have to stay away from everything that has omega-3 in it? The answer is "NO!" And here's why: Firstly, unless you've been (and still are) indoctrinated by the few remaining fish oil gurus, you won't consume >50% of your daily fats in form of (potentially rancid) DHA and EPA. The effects of endogenous oxidation of an increased level of omega-3 in your organs are thus probably very limited. The latter brings the intake of already oxidized N3s back to the focus and with it the second reason why I don't think you have to freak out: If you adhere to the "SuppVersity Fatty Fish over Fish Oil"-rule while carefully selecting either fresh (not unthawed) fish or the "right", properly and shortly stored canned fish products, you should be able to reduce your exposure to peroxidized N3s to a level that's way below the still undetermined harmful level. In short, unlike Miller et al. who write in the discussion of their results that "the beneficial effects of this diet may have been outweighed by the negative consequences of the peroxidation," I would like to highlight that the risk of actually doing more harm than good by keepin' an eye on proper omega-3 intakes (1-2g/d) is low and can be limited even further by consuming your omega-3s in form of fresh (not frozen, let alone products that undergo freeze-thaw-cycles) and minimally processed foods | Comment on Facebook! Albert, Benjamin B., et al. "Oxidation of marine omega-3 supplements and human health." BioMed research international 2013 (2013). Albert, Benjamin B., et al. "Fish oil supplements in New Zealand are highly oxidised and do not meet label content of n-3 PUFA." 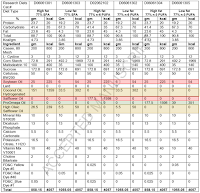 Scientific reports 5 (2015): 7928. Boran, Gökhan, Hikmet Karaçam, and Muhammet Boran. 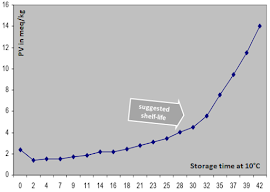 "Changes in the quality of fish oils due to storage temperature and time." Food chemistry 98.4 (2006): 693-698. Dellarosa, Nicolo, et al. "Enrichment of convenience seafood with omega-3 and seaweed extracts: Effect on lipid oxidation." LWT-Food Science and Technology 62.1 (2015): 746-752. Ferguson, Jane F., et al. "Omega-3 polyunsaturated fatty acids attenuate inflammatory activation and alter differentiation in human adipocytes." The Journal of nutritional biochemistry 64 (2019): 45-49. Garcia-Hernandez, V. M., et al. "Effect of omega-3 dietary supplements with different oxidation levels in the lipidic profile of women: a randomized controlled trial." 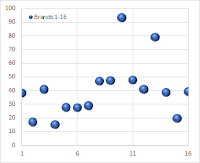 International journal of food sciences and nutrition 64.8 (2013): 993-1000. Gray, Patrick, et al. "Fish oil supplementation reduces markers of oxidative stress but not muscle soreness after eccentric exercise." International Journal of Sport Nutrition and Exercise Metabolism 24.2 (2014): 206-214. Halvorsen B. Lise, and Rune Blomhoff. "Determination of lipid oxidation products in vegetable oils and marine omega-3 supplements." Food & nutrition research 55.1 (2011): 5792. Hantz, Shelby. "Are over-the-counter fish oil supplements effective and safe for treating mood disorders? Studies on the top 10 fish oil supplements available in New Zealand." (2016). Martorell, M., et al. "Docosahexaenoic acid supplementation promotes erythrocyte antioxidant defense and reduces protein nitrosative damage in male athletes." Lipids 50.2 (2015): 131-148. Miller, James L., et al. "A peroxidized omega-3-enriched polyunsaturated diet leads to adipose and metabolic dysfunction." The Journal of nutritional biochemistry 64 (2019): 50-60. Okolie, N. P., et al. "Malondialdehyde levels of frozen fish, chicken and turkey on sale in Benin City markets." African Journal of Biotechnology 8.23 (2009). Pak, Chol Su. "Stability and quality of fish oil during typical domestic application." Fisheries Training Progamme, The United Nations University, Iceland (2005). Skarpańska-Stejnborn, Anna, et al. "Effects of supplementation with Neptune krill oil (euphasia superba) on selected redox parameters and pro-inflammatory markers in athletes during exhaustive exercise." Journal of human kinetics 25 (2010): 49-57. Wang, Yu-Zhu, et al. "Effects of a natural antioxidant, polyphenol-rich rosemary (Rosmarinus officinalis L.) extract, on lipid stability of plant-derived omega-3 fatty-acid rich oil." LWT-Food Science and Technology 89 (2018): 210-216.